614 Lancasters participated in an attack on five targets in front of Allied ground troops in Normandy. The German strong points and the roads around them were well cratered. 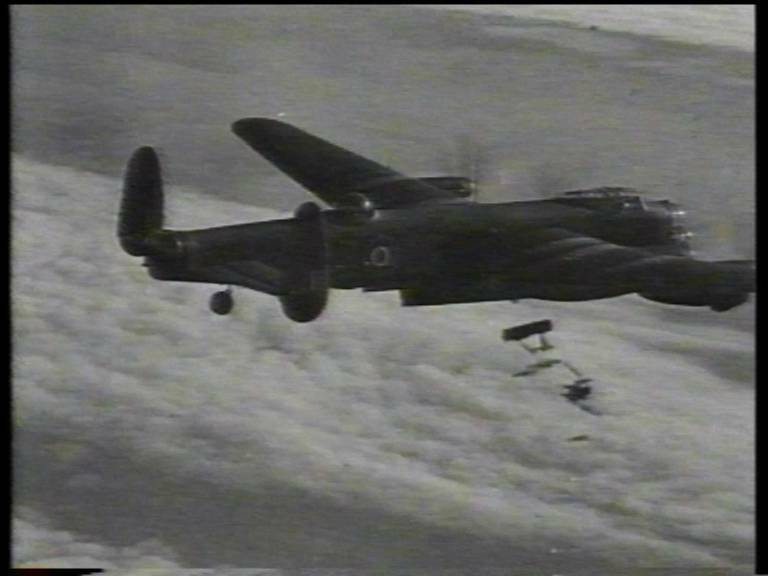 10 Lancasters were lost (Johnston saw 3 of these): 7 to German fighters, 2 to flak and 1 to an unknown cause. There was a lecture about the state of the Sgts’ billets this morning – so they marched us all up to do a cleanup. What a mess they were too! Got two blueforms this morning – one from Barb and one from Mom. Very nice letters too. Apparently the picture of the King and Queen which I was in, was in the Star (and here I just sent away for prints!). Went to Mare-de-Magne (just past Caen) to help the “Brown Boys” tonight. Over 1,000 aircraft on five targets around there. We were the last ones to bomb before the advance started and as we turned away the artillery opened up and they put on searchlights to show the troops the right way forward. The searchlights were on a low trajectory and so was some Bofors flak outlining each flank of the advance. I’ve never seen such a spectacle! We were at 8,000 ft and we had a good view. On the way back there were lots of fighters – three chops right around us so we weaved all the way back – Frank saw seven or eight fighters dodging amongst the bomber stream on his Fishpond. Everyone here got back OK though. All up weight for takeoff was 64,900 pounds – greatest I’ve ever taken off in a Lanc.